Above: Jared and Laurie Tarbell at their high-tech playground/lab, Levitated Toy Factory. TUCKED AWAY in the heart of Downtown Albuquerque, among a growing number of antique buildings being repurposed as breweries and art spaces, there is a futuristic jewel box that holds gems of a digital nature. This 6,000-square-foot single-story building was once a prisonesque satellite office for the city’s daily paper. Now sleek solar-panel awnings flank its perimeter like an eco-friendly hug. At night, the building glows in rainbow hues cast by a trinity of large, street-facing windows that double as projection screens. Sensors detect passing pedestrians, triggering an interactive display. This high-tech edifice is a creative workshop called Levitated Toy Factory. The interior, with its concrete floors and glass walls, is stripped down to the essentials, bones exposed. Visitors are greeted by potted plants that mingle with large 3-D shapes, such as wooden geodesic spheres. Down a hallway—past the kitchen with its cheerful candy-apple red fridge and a display case of Lego men— there’s a glowing, multicolored star field made of 2,222 light-emitting diodes that illuminate the ceiling. Ambient electronic music floats through the airy passage. To the right there’s a room with more colorful light configurations and a large steel bank vault where servers are stored. Ahead is the nucleus of this experimental playland. In the studio you find laser cutters, raw natural materials like plywood and cardboard, and some of the more tangible artifacts created here—puzzles based on ancient shapes, scalable playground sets—recipes for which are written in code that’s shared freely online. Special effects illuminate the Levitated Toy Factory storefront. Levitated is the product of the prodigious imaginations of Laurie and Jared Tarbell. Here in Albuquerque, the Tarbells have received extensive acclaim for their forward-looking efforts. Parents of young children, the pair live just upriver from the city’s paved urban heart in Albuquerque’s bucolic North Valley. Laurie, 40, is an architect and urbanism advocate who sits as the vice president of the Downtown ABQ Main Street Initiative, a nonprofit whose mission is to preserve and revitalize the commercial district. Jared, 42, is a digital artist and developer who, from a small apartment in Albuquerque in the mid-aughts, quietly co-founded Etsy. If you’ve never experienced the thrill of purchasing, say, letterpress thank-you notes, a custom necklace, or a dog sweater from this online bazaar, Etsy is a peer-to-peer e-commerce site where individuals can buy and sell handmade cottage-industry items. It helped ignite DIY (do-it-yourself) maker culture—the millennial ethos that unites consumers and artists and artisans, or even coders working in digital spheres, all creating and transacting goods independently. Etsy established the global marketplace for makers, and not only has it been a transformative force in retail, it has inspired and propelled legions of folks worldwide to commit creative acts and try to profit from them. Dog sweaters have begotten more dog sweaters. One of about a hundred food trucks in Albuquerque. Art meets espresso at Zendo. This 21st-century trend that Tarbell helped birth is flowering in Downtown Albuquerque—an area experiencing exponential growth as a hotbed for tech and creative talent. While a bevy of business incubators nurture new ventures, urban lifestyle amenities such as coffee shops, food trucks, farmers’ markets, breweries, boutique hotels, bike shares, and arts happenings aplenty have appeared in the area. (In the fall, the Huffington Post gave Albuquerque a shout-out as one of America’s five “secretly cool cities.”) Meanwhile, new housing is popping up like thistles once did in so many packed-dirt lots. The state’s most urban area is being reborn. Laurie and Jared are both New Mexico natives with scientist fathers and artist mothers. She was raised on a farm between Las Cruces and Hatch, her father a NASA rocket scientist. Jared grew up in Albuquerque, his father a nuclear physicist and engineer at Sandia Labs. “Having that duality at home where you have technology and you’re not afraid of it, and then you have this artistic view of the world and how to express yourself—I think a lot of kids are in that situation here in Albuquerque, and I like being around it,” Jared says. The couple met in the late nineties while attending New Mexico State University in Las Cruces, after Laurie emailed Jared about his website, which stood out. They moved to Austin amid the first dot-com boom. Jared programmed websites to enable online bill payments (a novelty in the year 2000), while Laurie learned green building in an AmeriCorps position. Six months later, when the tech bubble burst, Jared took his first creative sabbatical, establishing Levitated as an open-source site, giving his code away for free. As Levitated gained recognition, Jared was invited to give lectures around the world and contribute chapters to books. In 2004, they returned to their home state when Laurie enrolled in the Master of Architecture program at the University of New Mexico. The following year, Jared joined a few friends in the creation of Etsy, working at home in solitude as its technical creative component. Though he relinquished everyday involvement in Etsy operations in 2011, he retains significant ownership. The company went public last spring and is now valued at nearly $2 billion. But rather than opting for a palace in Palo Alto, the Tarbells remain planted in Albuquerque. 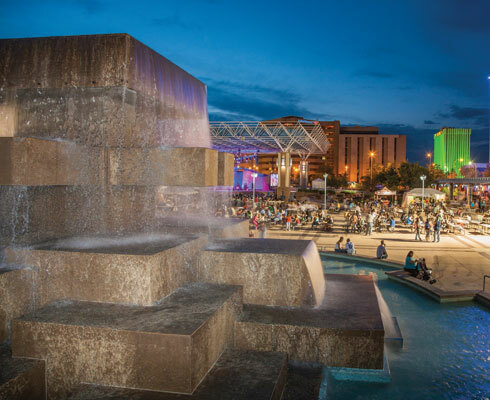 Family-friendly events at Civic Plaza are part of the Downtown comeback. Until a couple of years ago, finding a sizable startup here was a rarity. No longer. 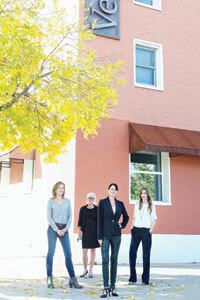 Some team members of the ABQid startup accelerator, from left: Katie Rice, Lori Upham, Pamela Weese, and Amanda Gianini. From Goddard to the Manhattan Project to nebulous present-day sciences (nanotech! ), New Mexico has had a long love affair with technology. Realizing the need to curb brain drain and retain creative capital while creating jobs and keeping investor cash from moving across the state line, local entrepreneurs, the city government, NGOs, Kirtland Air Force Base, the national labs, and higher education institutions began working in concert to turn Albuquerque around. As a result, there is now an abundance of business accelerators, incubators, and resource centers. Most of these are headquartered Downtown, an area that might be roughly defined as being bound by I-40 to the north, I-25 to the east, Avenida Cesar Chavez to the south, and Rio Grande Boulevard to the west, with the city’s “innovation corridor” running west to east, up Central Avenue to UNM. The Duke City’s core, which grew up around the railroad in the late 19th century, fell victim to urban renewal and sprawl during the mid-and later 20th century. A streetcar system was removed and, later, historic buildings were razed. For the past quarter-century, the city’s most dense, walkable area—and its seat of local government—has been an epicenter for fringe culture. It’s where you’d find the rock venues and unpretentious art galleries (well, maybe a little pretentious), the seedy skin bars and smoke shops—peppered with a few charming holdouts from the Mother Road glory days. That’s all still here, but now there’s more of the polite stuff—restaurants, cafés, shops, performance spaces, family-friendly civic events, more art in general—and more people. Where once it was a no-man’s-land trespassed only by the creative, the boozy, or the government-employed few, investment dollars are beginning to transform the area back into fertile ground. Despite all the development brewing, you can still rent a house (or a two-bedroom apartment at the Imperial Building) for under $1,000 a month and find a local craft beer for under $3 and great green chile cheeseburger sliders to go with it. And if you want to hang your art in a gallery or have your band play its first live show, you can still do that, too. Though it’s home to roughly 560,000 residents, this three-century-old Spanish Colonial crossroads is an unassuming metropolis that retains a certain unconquered, frontier-like quality. It’s a community that prizes creativity (there’s art everywhere), and many find themselves putting down roots because of the temperate climate, uncommon natural beauty, relatively low cost of living, and a magnetism that nobody can quite put their finger on. This reality—whether to the city’s benefit or detriment—is obscured by TV’s Cops and Breaking Bad, which portray it as bleak. But despite lacking the resolute glamour of other cities, for makers Albuquerque is a place to shine. 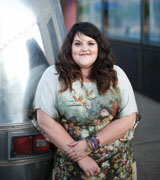 Tess Coats with the Airstream that is her Spectacle Caravan Retail Boutique. Zendo owner Pilar Westell and barista Hunter Shiosita. 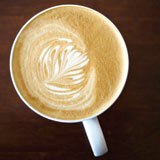 Latte with a flourish at the Brew. In the parking lot behind Levitated sits an Airstream that houses Spectacle Caravan Retail Boutique. The Tarbells allow owner Tess Coats to stash the roving store there. 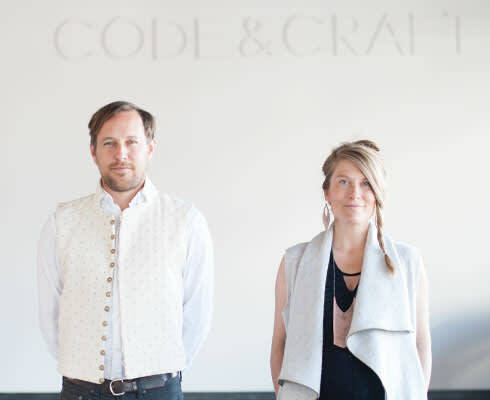 Through participation in Albuquerque’s new entrepreneurial support systems (such as ABQid, FatPipe ABQ, and Hautepreneurs), the Fashion Institute of Design and Merchandising grad fine-tuned her business model. “You can plant a seed pretty inexpensively here and have opportunity. Essentially you’re a big fish in a small pond,” she says over coffee at Zendo, a minimalist café and gallery located at Second Street and Coal, formerly one of the seedier parts of Downtown. Now on any given day you can spot caffeinated coders and creatives pecking away at laptops. Networking within this community, Coats has met makers whose products she’s selling at Spectacle—like Howl Cosmetics’ vegan lipsticks, Oropopo’s laser-cut jewelry, and ceramics from Hanselmann Pottery. Local furniture designer Rocky Norton—who created many of the concrete, steel, and wood furnishings at Zendo—is slated to remodel her Airstream’s interior. Entrepreneurs like West are surfing a sense of hopefulness about the mile-high valley that hasn’t been felt in years.